South Sydney Rabbitohs captain Greg Inglis says he is "leaving the door open" to a cross-code switch. Inglis, 28, has won the World Cup and two Four Nations' titles with Australia and was in the Queensland side that won eight straight State of Origin series. 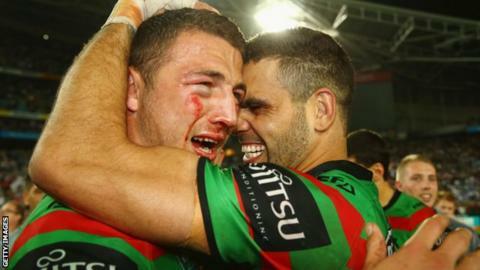 Now he is being tipped to follow former team-mate Sam Burgess into rugby union. "I am never going to close doors. I leave everything open," he said ahead of his side's World Club Series meeting with St Helens on 22 February. "You can always see what is on the other side. There is no harm in looking." Burgess joined Bath in October and has already played for the England Saxons side. Inglis is contracted to the National Rugby League side until 2017 and said he had no intention of leaving Australia's most successful side before then. The visitors to England are aiming to become world champions for the first time, a feat St Helens have achieved on two occasions. And Saints captain Jon Wilkin does not feel there will be any excuses for Souths if they lose, despite having only arrived in the country on Monday. "They have come halfway around the world but they have flown business class," he said. "It is not very difficult to lie down for 24 hours and watch films and get served on. "It has taken them a day to travel but I would bet some of our team spent the whole of Sunday sitting down as well, so there is probably not much difference in preparation."